United Cutlery Swords are available in assorted styles. Officially Licensed movie swords including the Lord of the Rings and The Hobbit Movie Swords are available. Additionally, United Black offers functional Samurai Swords and Tachi Swords with 1060 Damascus steel. The blade tang has an exclusive stamp that can only be found on a United Black sword blade. 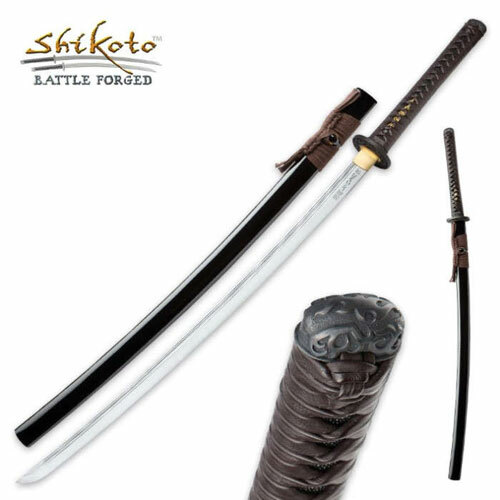 Shikyo Samurai Katana Swords for sale are from the popular United Cutlery Black Collection. The Shikyo Samurai Katana Swords measures 43 1/8th inches in all. This traditional and authentic Japanese bushido sword features a mirror polished, functional 29 ½ inch sharpened samurai katana style blade. The blade is crafted of heat-forged 1045 carbon steel and has a heavy blood groove. The blade tang features the United Cutlery Black Collection stamp, a stamp that is only used on the blades of genuine swords in the United Cutlery Black Collection. The hardwood handle offers black ray skin and custom leather wrap accented with brass menuki and a uniquely designed cast metal guard and pommel. These handsome samurai katana swords for sale also include a hardwood sheath which features custom cloth cord wrapping that coordinates with the handle. Buy the real Shikyo Bushido Katana Swords from the popular United Cutlery Black Collection for $159.99.